THE ULTIMATE DIVING MOUTHPIECE – THE RESULT OF 20 YEARS in the moldable mouthpiece business! SeaCure was created by an orthodontist, is guaranteed to fit YOU – PERFECTLY and is the only moldable “and remoldable” mouthpiece offset for both the upper and lower jaw positions. Now available in NEW SIZES to fit Apeks, Poseidon and rebreathers! 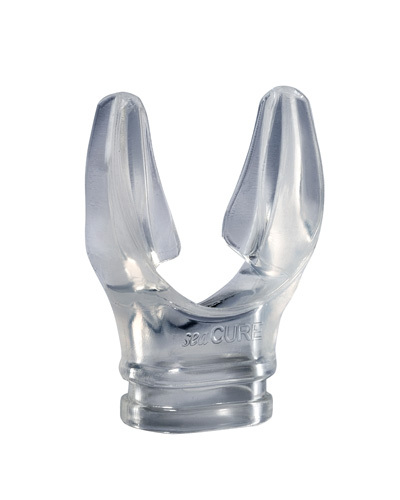 The new and improved X Type SeaCure Custom Mouthpiece offers a totally new X shaped profile, which significantly reduces bulk, virtually eliminates gagging and improves molding by earlier engagement of the teeth during closure. The new X Type also includes an improved one piece molding and sealing attachment. The attachment is used in the molding process and then to keep debris out of the regulator. It now provides a NEW bite limiter which eliminates the possibility of over closure during the heat molding process, thereby preventing reduced air flow during diving. In addition to the previous sizes, the X TYPE is available in 2 NEW SIZES to fit Apeks, Poseidon and many rebreathers. Finding a mouthpiece that offers both unbeatable security and comfort has forever been the diver’s dilemma. SeaCure has been the definitive answer since 1992. It was created by an orthodontist and is guaranteed to fit YOU – PERFECTLY! Buy Seacure Custom Mouthpiece X Model from Divers Supply at the best price. Seacure Custom Mouthpiece X Model comes with full Manufacturers warranty because Divers Supply is an authorized dealer for everything we sell.